On Thursday 8th February, Arsenal FC & Arsenal in the Community hosted an educational event for young people from local schools, run by Show Racism the Red Card (SRtRC) which featured former Arsenal Players and special guests answering young people’s questions about racism and hate crime. 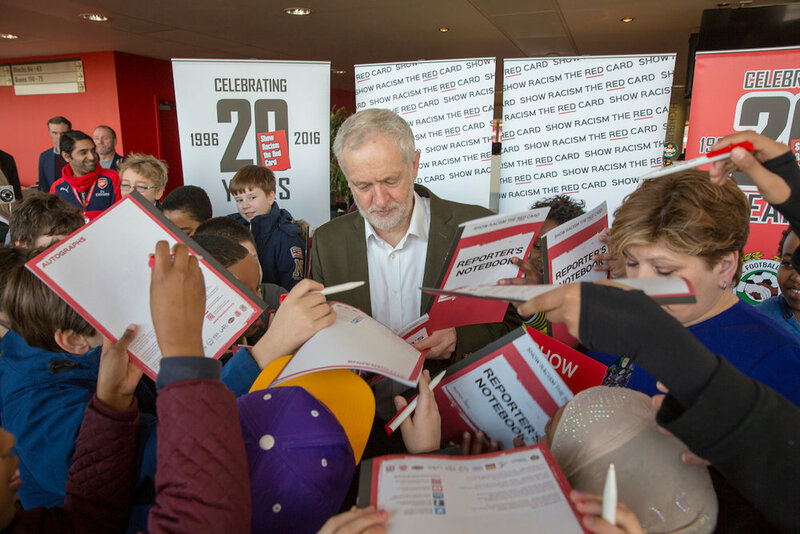 120 Pupils from local schools attended the Highbury Suite at the Emirates Stadium to take part in workshops exploring racism, stereotypes and what hate crime is, before the panel Q&A in the afternoon. The morning session was opened by the Leader of the Labour Party, Jeremy Corbyn who stayed to take part in the workshops. Also attending the morning sessions were local MP, Emily Thornberry, and former Arsenal and England Women’s team player, Rachel Yankey OBE. The afternoon panel included former Arsenal players, Michael Thomas and Perry Groves. Also on the panel wereJason Lee and Simone Pound from the PFA, Manisha Taylor and Shona Chitate from Show Racism the Red Card and MP's ,David Lammy MP (Tottenham) and Tan Deshi (Slough). The event is part of the club’s Arsenal for Everyone campaign and one of a series of fifteen SRtRC educational events with football clubs in England to educate about hate crime as part of a project supported by Department for Communities and Local Government (DCLG), which will also include educational work in schools and teacher training. The project will build on the government’s work detailed in the Hate Crime Action Plan to challenge the misconceptions that lead to hate crime and support victims from marginalised communities to stand up and report incidents. Arsenal FC has worked with the campaign consistently over many years to educate about racism. “SRtRC can now build on our work to educate about Hate Crime with this project and it comes at a time when it is definitely needed. After the EU referendum, many police forces reported a spike in hate crime and hate incidents, a 41% rise in the month following the vote.